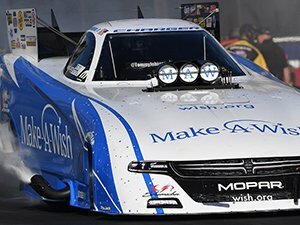 POMONA, Calif. — Friday’s results after the first two of four rounds of qualifying for the 54th annual Auto Club NHRA Finals at Auto Club Raceway at Pomona, final of 24 events in the NHRA Mello Yello Drag Racing Series. Qualifying will continue Saturday for Sunday’s final eliminations. Top Fuel — 1. Leah Pritchett, 3.649 seconds, 329.34 mph; 2. Clay Millican, 3.702, 327.19; 3. Antron Brown, 3.704, 329.50; 4. Steve Torrence, 3.704, 327.35; 5. Blake Alexander, 3.711, 330.88; 6. Billy Torrence, 3.711, 328.86; 7. Doug Kalitta, 3.740, 319.29; 8. Richie Crampton, 3.756, 319.52; 9. Scott Palmer, 3.767, 328.38; 10. Brittany Force, 3.772, 324.28; 11. Tony Schumacher, 3.792, 326.24; 12. Terry McMillen, 3.794, 325.61; 13. Shawn Reed, 3.858, 312.35; 14. Mike Salinas, 4.211, 208.20; 15. Cameron Ferre, 4.946, 144.75; 16. Audrey Worm, 7.731, 92.70. Pro Stock — 1. Jeg Coughlin, Chevy Camaro, 6.527, 211.39; 2. Erica Enders, Camaro, 6.530, 211.39; 3. Jason Line, Camaro, 6.531, 211.56; 4. Tanner Gray, Camaro, 6.537, 209.59; 5. Matt Hartford, Camaro, 6.550, 211.39; 6. Alex Laughlin, Camaro, 6.550, 210.18; 7. Greg Anderson, Camaro, 6.557, 212.09; 8. Bo Butner, Camaro, 6.558, 211.03; 9. Chris McGaha, Camaro, 6.560, 211.89; 10. Drew Skillman, Camaro, 6.562, 211.43; 11. Deric Kramer, Camaro, 6.570, 210.50; 12. Alan Prusiensky, Dodge Dart, 6.590, 209.20; 13. Kenny Delco, Camaro, 6.612, 208.55; 14. Fernando Cuadra, Camaro, 6.615, 209.88; 15. Val Smeland, Camaro, 6.697, 207.27; 16. Joey Grose, Camaro, 6.738, 196.36. Not Qualified: 17. Steve Graham, 7.091, 157.19; 18. Tom Huggins, 7.481, 142.03; 19. Vincent Nobile, 12.494, 71.25.